It’s 2:30 in the morning and I cannot sleep. Simply put there is just too much going on in my mind. I have this problem all the time, it seems that when I lay down I just can’t go to sleep. The worst part is this is such good inspiration for writing, but I’m so unfocused that I can’t write a descent sentence. I think that is more frustrating to me than not being able to sleep. I have a very vivid scene in my mind, and no way to give it life with my words. I think this mirrors the frustrations I face during the day as well. Sometimes I let my mind get in the way of things, always thinking too much about stuff, over thinking things, dwelling on stuff. When I was young I was told that if I had a dream and I spent every bit of myself working toward that dream I would eventually achieve it. It’s funny how as a child you are so enamored with concepts of purity that you think that this could actually be true. I recently watched a movie that spoke about how ideas were infectious, and once planted in the mind they would grow of their own volition and end up sprouting. I think the idea of chasing a dream is in that realm, for me. Constantly in my life I have been reminded of how untrue that fable really is, that dreams are just that, something that you strive for but is ultimately impossible. I dreamed I would be an astronaut, a police officer, an FBI agent, an amazing writer, a chemist, the list goes on. I dreamed that I would make a difference in the lives of others, and that I could touch them through just being who I am. I dreamed the American dream, that I would find someone who loved me and we would have the white picket fences. Those dreams all died in their own time, some of them lasting only a brief moment, others persisting until the dread reality of life closed in upon me. …the door behind him. He leaned against it, feeling the heat from the day beating upon it’s exterior, as the cool wave of air from inside sent a chill over his body. An empty feeling came over him, and he wondered if this would be the first step that led to the end. This was not a new thought, however. He often worried that the walk down that path had started, for days at a time he would think that this would be the last time, but then he would see her again and things would be better than ever before. 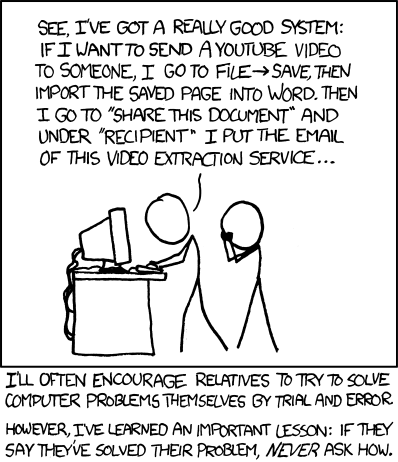 An image from xkcd.com, all credit goes to him for creation! At times I’m a very visual person, I tend to like to have things spelled out for me in a fashion in which I can envision the way things work. When I am reading, or remembering what I read, I don’t remember the words, but the scenes and emotional connections that are created by the words. I can tell you exactly what happens in my favorite books, not by remembering how the author wrote it, but by the way I envisioned it. It makes sense to me, then, that I view the life of a person in terms of a ballet of back and forth. I have discovered a new little pet peeve, which is awesome, because it proves as I get older I get grumpy, which follows the normal trend! What thing could possibly irritate me, the easiest of easy going? It’s something I noticed on the way to work today. There are several areas I pass through on my way to work that have speed bumps, being a university campus there are a lot of students walking, and speed bumps are a must. I don’t have a problem with the speed bumps, but I do have a problem with a particular type of person who drives over these speed bumps. There is always an interesting period when you meet someone new in which you are constantly wondering what is going to happen. There is nothing that ever says anything is definite, no matter how amazing things are going. I’ve heard of people being almost absolutely head over heels for someone, and then suddenly that person does this one little thing that changes everything. I’m unsure what it is about meeting new people that makes most people this way, almost like we are expecting the worst thing possible to happen and because of that we focus on the negative. What really makes me wonder about this is I remember reading in some article somewhere that most couples have at least ten things at any one time in their relationship they don’t agree with each other on. These could be very simple, like who should be the next person to take out the trash, or very complex issues based on morality or beliefs.